I am terrible at reviews, not because I lack the vernacular to write about something, see that there that’s at least a two dollar word, it’s because I feel I never do justice to what I have read. I have a terrible habit of reading others reviews and seeing that they break down every page, every twist, every turn, and even delve into what things could or should mean. I’m not that guy, again I am intelligent and thorough enough to do that, but when I read something I want to make my own conclusions, draw forth my own thoughts. So I always come to a compromise, I will tell you what the book is about in the vaguest of senses, like you might as well read the back of the book to get a feel for it kind of vague, and then I will tell you what I thought of the book without giving even the slightest possible thing away. I do this with all my reviews or books and even movies, I want the reader to read the book, but also to connect their own dots, like a great song an amazing book means something different to everyone. When Imogen was young she told her sister Marin fairy tales. Once upon a time, she’d tell her, there was a way out, out of their awful lives, away from their abusive mother, this way was on the backs of fairies. As an adult Imogen realizes that the true escape had been in telling those tales and so she continues to tell them as a writer who is still grappling with the nightmare that was her childhood. Reunited with her sister at an artists’ retreat Imogen is forced to confront her past. The debut novel of author Kat Howard (I linked you folks to the Amazon pages, spoiler the book is great go buy it) is nothing short of amazing. A fan of all sorts of Fiction Roses and Rot had me enthralled in the story the entire time. I was no longer just an audience member reading a book to what will definitely become a best seller, I was a part of the story, a witness to something beautiful yet horrifying in the same way. Howard’s Attention to detail, ability to surprise me as a reader, and use of the Grimm styled fairies that I have come to love and fear in the world of Fantasy had me smiling and grimacing all the same. Like I said before I refuse to spoil this book, but I can definitely assure you that this is one that I will share with all of my readers, friends, and family. Kat Howard deserves nothing less than a standing ovation for this novel, and I personally can not wait to see what she does in the future. If you haven’t heard well now here it is, Injustice 2 is coming! I have never been a massive proponent of fighting games, the storylines never really worked for me, but me being the DC Comics fan that I am, I had to try Injustice: Gods Among Us. I loved it, the game is extraordinary, the add-ons were fun and added to the storylines, and I never truly became tired of the gameplay. Okay, so I’m pretty late to the game here, and for the most part that’s my fault. I am a huge fan of books, so much so I have a stack of then just waiting to be read, and so one after another I devour them and love every minute of it. Problem is keeping track of my favorite authors books and them finding the proper time to fit them into what is an already busy schedule. So my sincerest apologies Mr. Cline, also if you’re reading message me on Twitter @notsosilentmike and I’ll gladly interview you or just shoot the breeze with you about nerd things. 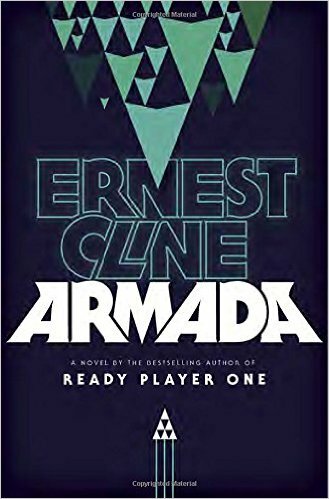 So this is going to be a far from usual review as I am doing this right after reading Armada (read it, buy it, love it!) and I’m writing this with the glee of a five year old who just found where all of the Halloween candy is being hidden. Armada was amazing, from the very beginning you’re pulled into Zack Lightman’s world. The depth and beauty with which things are explained, but not overly so which allows you, dear reader, the ability to throw your own bit of allows twist on some stuff. The nerdy mentions, the gaming jargon, the stories of the characters, all of these were set to create a rich universe that I could see myself in. To conclude what is basically me gushing about this book I highly recommend it. As always share, comment, but never hate! It’s time! It’s time! It’s nerd time! A quick update for all my fellow comic book fans out there, Saturday May 7th is in fact Free Comic Book Day, so go to a participating store and enjoy yourself some awesome free comics! In other news Captain America: Civil War is out this week, has been out in other places for a little bit, and for all intents and purposes it is getting very good reviews. I haven’t seen a really bad thing about it so I am excited to see it this weekend and maybe do a quick review later on, maybe. In Power Rangers news we have seen through some leaked pics a second costume for Elizabeth Banks Rita Repulsa as well as Entertainment Weekly posted a picture of the new Power Rangers costumes. Not my picture, credit where credut us due! The costumes look a lot more armored, slightly reminiscent of ye olde’ Power Rangers movie of my childhood, but my assumption with CGI and all the money they will pour into the effects all the costumes will look a bit different come 2017 when the movie comes out. What do you think about the costumes? The re-emergence of Power Rangers back into pop culture? Are you gonna watch it? Let me know in the comments. As always comment, share, but never hate! Punisher, Star Wars, Free Comics & More! One batch, two batch, penny, and dime! The Punisher is set to become another Netflix Original and will have his own series coming soon! Now I spoke about Jon Bernthal’s contract a few months ago, as a source I have told me some very new, very private information. Now I can proudly stand up and say that the scoop I gave GeekNerdNet.com from my source was pretty much right on, and it feels good. I’m 1/1 on Marvel scoops and may very well stop there, being 100% is a nice feeling. Now I was told a “Marvel film” was a possibility and he also signed for two “TV shows” mind you in this day and age Netflix accounts for TV so there we go, now if he appears in a movie I’d be over the top on that, but how many street level characters are we going to see in the big boy films? I’m happy Bernthal/The Punisher just received a Netflix Original season, it definitely shows how ridiculously popular the character was, and the sympathy we all felt for a man who was basically broken makes for better watching in my humble opinion. know what Di sney is, next week is Star Wars Day also known as May the 4th is next week! Wednesday to be exact, so pull out your Vader or Kylo helmet, your Wookiee shirt, or anything else from that “Galaxy Far Far Away” and enjoy a nice fun day! It seems this next week is riddled with fun times because on May 6th Captain America: Civil War is out in theaters and I don’t know about you, but I feel like I would have seen half the movie with the 30 plus TV spots Marvel has put out, maybe slow it down there guys. You already have the fan base, you don’t need to force a movie everyone has been waiting for down our throats. All-in-all though I’m excited for it and will definitely see it more than once, because although I love DC I also Love Marvel, blasphemy you say? I say you’re foolish if you have to separate them, or pit one against another, they both can be great all on their own. I am looking forward to the deeper introductions into the Scarlet Witch and Vision, as well as the evolution of the Falcon. Bringing in Ant-Man for a little light heartedness, and Black Panther for another twist and agenda is always interesting. With so many characters and the return of Spider-Man to his roots in Marvel I am excited to see how they use him, and how much of a part he plays in the whole movie. From what I have seen there is so much going on it’ll be a little bit squished in there, but if they learned anything from doing too much with Age of Ultron I feel they will be in safe hands and do a great job. Early reports have it being a fantastic time and a movie you’ll definitely want to see. Now here’s a tad bit of information you may not have had before, now take a deep breath because I know a lot is going on next week, but make sure to visit a participating comic book store for Free Comic Book Day’s 15th anniversary! So go to your favorite comic book ho spot and enjoy the festivities! A lot of places are having signings, giveaways, food, and all sorts of different types of fun. As always folks share, enjoy, comment, but never hate! Power Rangers, Green Lantern, and DC Comics OH MY! Alright well I gather I should start at the beginning, after a few days of things that really didn’t strike up my fancy here we have a few interesting bits of new news. Elizabeth Banks is onset now as Rita Replusa as seen on the website JustJared.com and few other sites around the web. Elizabeth Banks as Rita Repulsa for the 2017 film Power Rangers. A solid look at the full costume in broad daylight and I’m pretty excited to see what they do with such an iconic villain, well iconic to those of us that can still dig Power Rangers in one way or another. A new look for her costume, and possibly a slightly grittier version of the once “silly” villain, a plethora of surprises ahead for the new Power Rangers Movie that comes out next year, and this could be something that re-popularizes what Power Rangers once used be to us that remember the original Mighty Morphin version all those years ago. Now from colorful Rangers and a green villainess to DC Comics and their Emerald ring slinger the Green Lantern. A “scoop” occurred earlier that said the “Green Lantern Corps” movie would feature not one, but three of the Earth based Green Lanterns out in Sector 2814. Those three would be Hal Jordan, John Stewart, and the young stalwart GL Kyle Rayner. Now if these rumors from the website LatinoReview.com are to be believed out of the six human based GL’s from the Corps, no to mention the very first Green Lantern Alan Scott we are only going to see these three. Personally I don’t believe the hype, merely because the movie is 4 years away, Green Lantern hasn’t been brought up in the DC Movie-verse yet, and why not Guy Gardener, or possibly throw something new in there with Simon Baz? With all of the mythos that surrounds the Green Lantern’s and the legacy that it holds to I can see Green Lantern being done better than the last movie, and adding a ton more diversity to what is already a really diverse DC Comics Movie-verse. Now sticking within DC we take a turn towards the actual comics themselves. Now over the last decade DC Comics have made quite a few changes. Whether it be the logo, or the costumes of said characters the biggest change came with Flash Point and the introduction of the DC Comics “New 52”, which didn’t really become too popular beyond a few very well written books. So then it became, after a time, “DC You” which saw Commissioner Gordon lose some years, gain some youth, and also gain a giant bunny rabbit eared mech-suit. He began running around, fighting crime, and calling himself Batman, while the real Batman couldn’t remember anything. It was pretty much like that all over DC, Hal Jordan wasn’t a real Green Lantern anymore, etc. So now they are “Rebirthing” the entire franchise, with some old, some New 52, some DC You, and some actually new characters. It will be an interesting mix, and we get to see the return of the old JSA which makes this fanboy very happy. With all of this going on it is easy to become disenfranchised by everything and start to take how creative some of this stuff truly is. I say to those that are feeling that way to take a step back and try to enjoy the fact that ten years ago we didn’t have half of what he have now as nerds. Alright folks until next time comment, share, follow, but never hate! The last 24 hours have been pretty heinous with not one, but two truly saddening deaths. The music and wrestling nerddoms have come together to mourn the deaths of WWE Legend Chyna, and Rock and Roll and all around music legend Prince. This year has obviously been wrought with quite a few saddening deaths, and it seems each year a wrestler that I enjoyed from my youth has passed away. So in this I would like to thank each performer who was taken from us far, far too soon. They gave us memories, created smiles world wide, and for even just a moment their individual star shined brighter than the sun. May they each Rest In Peace, and more than that may we each take a moment to realize the impact they had on us, no matter how small or vague it may seem. Without Chyna the WWE’s women division wouldn’t have evolved into the amazing group of women it is. Although that can be said for a few of the women on the old roster, and even a few of the younger talents today, Chyna changed the game. She was the DX enforcer, she worked with men, and she did what very few women would do in that generation. She was the WWF Intercontinental Title holder twice as well as the WWF Women’s Champion, she entered the Royal Rumble, hell she faced off with men taking some hard bumps. She was a pioneer, and even though the end of her life was not peaches she left a lasting legacy that wrestling fans should remember. I don’t know where this exact picture came from, but I dig it so credit where it’s due. nerdy bands so Prince hadn’t always been on my radar, especially not for most of my youth. One day I was watching “Jay and Silent Bob Strike Back”, one of my favorite movies, and they obviously make mention of “Purple Rain” in the beginning, so afterward I opted to watch it, and I loved it! I started listening to his music, his message, and to say he was just a musician is dishonest. The man was a definite artist and a talent that was unmatched and is definitely a legend in his own right. As always comment, share, repeat, but never hate. It is strange how a few days of watching the internet tear apart good, creative, and unique ideas will change one’s perspective, especially on something that I’ve been wanting to write about for a while. The original form of this article was going to be how DC and Marvel isn’t a “versus” kind of deal, but a situation where both companies need one another to perform well in theaters, as well as in the comic book industry as a whole. Because if one starts to falter the other may very well start to follow suit. Maybe one day I’ll get around to that story, but this one is about something a bit different. Over the past decade, maybe even longer, comic book fandom has grown to amazing proportions, and so has the popularity of nerd culture. This has always been something astonishing to me because the term “geek chic” did not exist when I was in school, being called a nerd was something you put up with and you went about your comic book business with close friends who were into the same thing. Now it seems I can’t throw a stone without seeing or meeting someone who has on a nerdy shirt and comments on my shirts as I do theirs. This expansion to me has been phenomenal, I’ve even been able to introduce my mom of all people to the TV shows Arrow, The Flash, Agents of S.H.I.E.L.D, and even took her to WonderCon this year, her first ever real Convention. The turn here though is with everything good in life some of the bad seeps in as well. The issue we’ve started facing as fans is those on the internet who feel they can consistently do it better, or who look for the issues in every nook and cranny of every movie. These people used to be called critics and were paid by news organizations to go out and judge the films they see. They still exist, except their voice is just a little difficult to hear amid all the websites out there that also write-up critiques. Plus we have social media where everyone and everything has been, can be, or will be heard. The complaints, the hate, the anger, but most of all the feeling of entitlement. That is what this is about, the feelings I have toward those within the fandom who feel entitled. These movies, cartoons, and fan films have occurred for such a log period of time that a lot of us have forgotten the time when we didn’t get a few comic movies a year, nor was the thing we love, the comic books from whence all the ideas for the movies have come from, were celebrated as widely as they are now. They don’t realize that one day all of this will indeed stop, the movies will over-saturate the industry and the money they make won’t be worth the studios’ time, or they’ll just grow weary of the complaints. The fact that “fans” within this industry are chasing off directors, scrutinizing every possible interview an actor has, and are months later getting “outraged” at the Guardians of the Galaxy movie for a line that was said is ridiculous and truly uncalled for. We need to focus on the good within the industry and yes if a major issue occurs talk about that, talk not threaten, not send hate mail, tweets, or Facebook posts. Talk like civilized people should. I one day plan to have a child that I would love to be a nerd, hell I have a nephew that is a nerd, but the status quo of nerdom needs to change ASAP for the younger generation’s sake, because we adult nerds are going to ruin something beautiful for the sake of just doing it. It all starts with going to a movie and not looking to over-analyze it, but looking to enjoy it. If you don’t, hey, that’s your opinion and you are more than welcome to talk about it like a person, but the disparaging hate needs to quit and soon. This is just my take, what’s yours? Read, comment, discuss. Don’t hate though. Never hate.